Trump: (Pelosi) is so petrified of the ‘lefties’ in her party that she has lost control. US President Donald Trump bitterly attacked top Democrat Nancy Pelosi yesterday, and she again insisted that he end the government shutdown before border security talks can begin, but there were hints of possible movement in coming days. 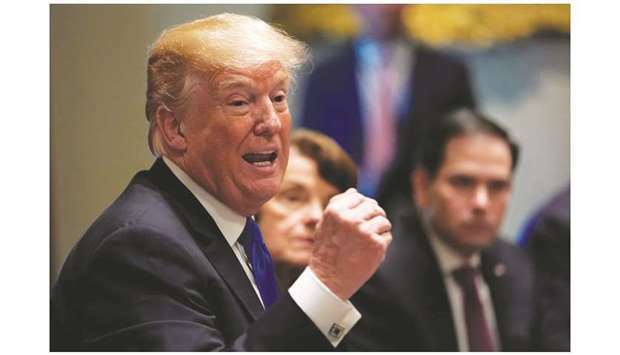 Trump lashed out on Twitter a day after Pelosi, speaker of the House of Representatives, dismissed as a “non-starter” his offer to extend temporary protection to about 1mn immigrants in return for $5.7bn for the wall he wants on the Mexican border. “...And by the way, clean up the streets in San Francisco, they are disgusting!” he added, in a seemingly gratuitous aside. Pelosi’s congressional district overlaps with San Francisco. Vice-President Mike Pence, who has been leading the administration’s contacts with Congress, said that the Senate would put the proposal to a vote as early as tomorrow. He called it “a good-faith compromise”. He insisted previously that he would not take up any shutdown bill unless both Trump and Democratic leaders backed it. “In a very real sense, what President Trump did here was he set the table for a deal,” Pence said on Fox News Sunday. The bill’s fate was far from clear. Republicans hope to lure the votes of a few Democrats from Trump-friendly states to reach the 60 votes needed, but they may lose some hard-line conservatives in the process. The Trump administration – increasingly blamed by Americans for the shutdown – is trying to thread a needle between those hard-liners and Democrats who adamantly oppose spending the $5.7bn Trump wants for a wall. They have offered something over $2bn for a range of other border security measures. Democrats assailed Trump’s new offer as cynical, noting that it was the president who – by moving earlier to end the DACA programme protecting 700,000 young immigrants and to expel some 300,000 others in a separate programme – had placed in jeopardy many of those for whom he now offers temporary protection. However, anti-immigrant voices also attacked Trump’s offer as tantamount to amnesty for the undocumented – a toxic concept for many conservatives. “No, Amnesty is not a part of my offer. It is a 3 year extension of DACA,” Trump said in another tweet. The Deferred Action for Childhood Arrivals (DACA) was former president Barack Obama’s programme to shield undocumented immigrants who entered the country as children. Representative Bennie Thompson, a Democrat who chairs the Homeland Security Committee, said that “I would not rule out a wall in certain circumstances”. Representative Tulsi Gabbard, who recently announced plans to seek the presidency in 2020, told CNN that it is urgent that both sides “come together and have a real conversation and hash out the differences”. “I can’t see us keeping federal employees, 800,000 people, out of work while we go back and forth on negotiations. “These negotiations could take three or four weeks,” he said on Fox.